2 full sides of baby back ribs, about 4 lbs. 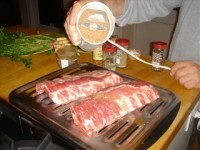 To prepare the ribs, grind the spices and salt in a spice grinder until fine. 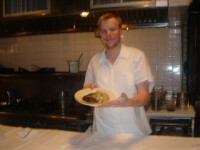 (Reserve a tablespoon of the spice mixture for the cabbage.) 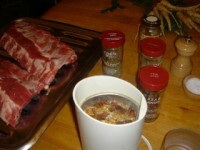 Sprinkle the slabs of ribs on both sides, cover loosely, and chill overnight or for two or three days. 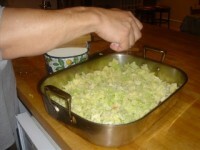 To make the mostarda, cut the quince into large chunks and toss in a bowl with the sugar. Store overnight. The next day, mix in the lemons, mustard seeds, and verjus and bring to a boil, stirring. Let simmer for 30 minutes. To prepare the vegetables, put the garlic, onions, carrots and cabbage in a wide pan with the olive oil, a generous sprinkling of salt, and 2 cups water. Cook over medium high heat until the vegetables are half wilted. Brown the ribs on a rack under the broiler just until golden brown, 10 to 15 minutes. Place the ribs over the cabbage mixture, making sure to add any juices, fat, and the reserved spice mixture. 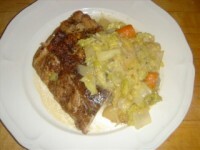 Roast the ribs and cabbage on a 375 degree oven, until the meat is tender, another 30 minutes. 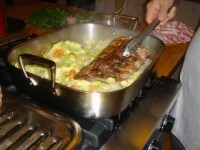 When the ribs are tender, remove them to a warm plate, and cook down the cabbage mixture until completely soft. Stir in 2 cups of the mostardo, taste and adjust the seasoning. Serve warm. Note: You can cover this dish with foil, chill, and reheat in a 350 degree oven the next day. Recipe adapted from a recipe given to me by Johathan Waxman, chef/owner of BARBUTO in New York City.